Discover dental procedures that will change more than just your smile. You can tell a lot about a person from their smile. A smile can reveal much about an individual’s personality and self-confidence. However, if a person cannot take pride in their smile due to issues that can cause them to feel insecure – misalignment of teeth, discoloration, or missing teeth, to name a few – smiling can have the opposite effect, causing one to feel self-conscious and ashamed. 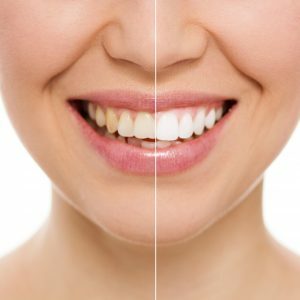 “Before and after” smiles of individuals who have had extensive dental work done not only showcase the physical evidence and proof of a dentist’s expertise, but also offer hope to those who may be in need of a smile makeover. Smile transformations can change not only a person’s visible smile, but also their quality of life. Let’s take a look at how through exploring dental procedures that will make a huge difference in the look, feel and overall health of your smile. Say goodbye to stained teeth or teeth with silver cavity fillings and hello to sparkly, shiny, pearly whites! Teeth whitening and white fillings are an easy and relatively cost effective method of making teeth look brand new. Certain food and beverages, medications, tobacco usage, trauma to teeth, and even age can cause white teeth to change color over time. 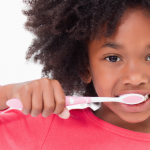 Whitening is the process of using bleach to break stains on the teeth up into smaller pieces, brightening the color. Even though there are a myriad of whitening products available over-the-counter, teeth whitening is more successful and effective when supervised by your dental care provider. For patients who are in good oral health and free from periodontal disease, dental implants – whether for a single tooth or multiple teeth – can replace severely damaged or missing teeth. An implant is an artificial tooth that look just like a natural tooth and is placed into the jawbone. A smile before and after a dental implant can be like night and day. Visibly, a gap or space that is missing a tooth is filled, making your smile complete. Behind the scenes, patients with dental implants are able to bite and chew more naturally and the jawbone and tooth root are preserved for health since they’re no longer exposed. Likewise, full or partial dentures can easily create a huge smile transformation! Crowns and bridges can cover over a damaged natural tooth to restore the original look, shape and function. 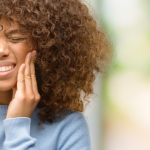 A tooth that is damaged may not only keep you trying to hide your teeth when you smile, but also can cause greater damage to your gums and surrounding teeth if not properly cared for. 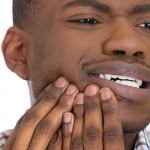 Crowns and bridges can also cover the tooth to prevent further damage to that specific tooth. Teeth that are stained beyond effective treatment by whitening, chipped without being damaged enough for a crown, or have gaps in them that may not be serious enough for orthodontic care may be candidates for transformation by way of veneers. Veneers are thin pieces of porcelain that are bonded to the teeth to recreate the original shape and look of the tooth, offering a minimally invasive but drastic transformation, evening out the teeth. 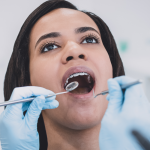 Braces and other orthodontic procedures can transform misaligned teeth and correct improper bites, teeth, and even the jaw. 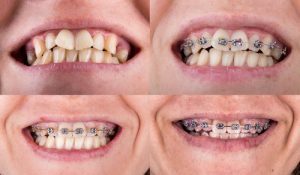 Teeth that are too far apart with gaps may be able to be pulled closer together by braces. A smile with teeth that are crammed too close together may be able to be spread apart by palatal expanders. The correct alignment of the teeth and jaw not only make teeth properly spaced in appearance, but also evenly distribute pressure when biting and chewing and relieve muscles stress that can lead to things like headaches and even neck and back pain. Teeth that are properly aligned are also easier to keep clean and significantly reduce the risk for future decay and disease. 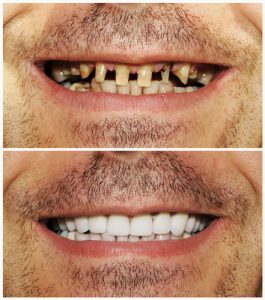 If you are wondering how to achieve the winning smiles seen in these before and after photos, contact the experts at Penn Dental Medicine. If you would like information on how Penn Dental Medicine can perform a smile makeover on you, call us at 215-898-7337 or request an appointment online.